In 1986 the communities of Old Encinitas, New Encinitas, Leucadia, Olivenhain, and Cardiff-by-the-Sea came together to create a spectacular new city, steeped in tradition and rich with history. Today, the City of Encinitas, California, found in northern San Diego County along the gorgeous Pacific Coast, is a place of new-world amenities and culture, perfectly balanced with old-world sophistication and charm. Stretching approximately six miles along the coast, Encinitas is home to around 60,000 residents and attracts visitors from all across the globe. Furthermore, Encinitas has an outstanding location just ninety-five miles south of the glitz and glamour of Los Angeles, and just twenty-five miles north of San Diego. Home to a thriving downtown business district and a famous Botanic Garden, Encinitas is a must-consider destination for luxury home buyers in Southern California. In the century-old downtown shopping district, you’ll find upscale restaurants, sidewalk cafes, specialty retail stores, quaint local shops and beautiful historic architecture. The before-mentioned San Diego Botanical Gardens encompass the largest bamboo display in the world and include an Amazon Rainforest. At another local hotspot, the Self-Realization Center, you’ll find a tranquil garden-like atmosphere with koi ponds and picturesque views of the Pacific Ocean and Swami Beach. Speaking of beaches, Encinitas is a surfing paradise in the North County area of the San Diego metropolitan area. The beaches of Encinitas run parallel to the historic Highway 101 and have terrains ranging from rocky bluffs to gorgeous white sand. 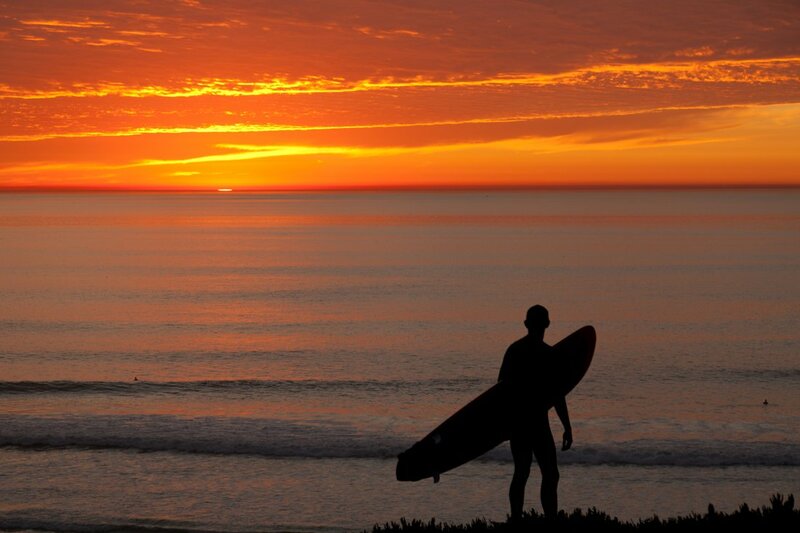 At the southernmost tip of Encinitas, you’ll find the popular surfing destination known as Swami’s. This spot is highly regarded by local surfers and has a great break. Adjacent to Swami’s you’ll find Sea Cliff and its idyllic ambiance with picnic tables, shade trees, and barbecues.North of Swami’s point and stretching approximately one-mile toward Moonlight Beach is Boneyards. Boneyards sits below the bluff, is accessed at D Street and is also a popular surfing destination. At the end of Encinitas Boulevard is Moonlight State Beach. This beautiful beach is the easiest to find and to use and boasts a large sandy beach, fire pits, volleyball courts, a recreational playground, and many more amenities. Other beaches include Grandview Beach, Beacon's Beach, and Stonesteps Beach. The Beach Boys memorialized the City of Encinitas with their hit “Surfin’ USA,” and National Geographic once listed it as being among the top twenty idyllic surfing destinations in the world. In addition to these fabulous beaches, the city possesses a diverse 1960s-inspired culture with delightful boutiques, chic art galleries, hip music stores, new age meditation gardens, zen yoga studios, trendy coffee shops and contemporary restaurants. Beyond the beaches, there are many other opportunities for entertainment and recreation. For example, the largest coastal wetland in the county, the San Elijo Lagoon Reserve, is found in Encinitas and is home to almost 300 different bird species. Another example, the Encinitas Ranch Golf Course, a public facility with five tees, is a par-72, 18-hole championship course that has breathtaking ocean views. The city’s Parks and Recreation Department maintain ten miles of streetscapes, 40.5 miles of trails, 86.63 acres of open space, and 143.25 acre of developed and undeveloped parks. Adding to the allure of this extraordinary city are the highly-esteemed schools, operated by Cardiff School District, Encinitas Union School District, and San Dieguito Union High School District. The natural beauty, shopping, dining, recreation, entertainment, and schools all come together to make Encinitas an excellent place to buy a luxury home. You can find opulent homes and oceanfront properties for sale in the 92024 zip code of Encinitas. Homebuyers desiring peaceful panoramic sunset views will quickly fall in love with the luxury real estate of Encinitas. It is common for homes in Encinitas to have lavish special features like private gated drives, ocean frontage, en-suite bathrooms, floor to ceiling windows, Jacuzzis and so much more. If you would like more information regarding Encinitas luxury homes, please allow us to assist you and contact us today.